A new book has just been published covering brief histories of the bands reported to have existed in the county (based on the current county boundary in 2018). In over 380 pages, with numerous photographs, Kenneth Owen has distilled the results of his six years of research in the libraries of the county into this excellent reference book, and guide to bands of the past and present. From Alcester Victoria Silver Band to Wood End Silver Band, over 130 bands are covered, ranging from the earliest formed around 1840 to the latest in 2006. It also includes a chapter on bandstands in Warwickshire. This work is a successor to Kenneth’s previous book on the history of Leamington Spa Brass Bands. “Brass Bands of Warwickshire” is available by post (£10 + £2 p&p) from Kenneth Owen, 167 Kinross Road, Leamington Spa, CV32 7ET. If you wish to contact Kenneth by email, then let me know (see my “Contact” on the right) and I will put you in touch. The South Street Mission was located in Macbeth Street, Hammersmith, Middlesex and was founded in 1901 by Sister Lizzie (d. 1949). The band was founded in May 1909, and was active through to the mid-1950s, competing in a few contests in its later years. The band supported the work of the mission, as did many similar bands in London and across the country around that time – combining their music, marches and crowd-pulling assets to attract people to the services, various events and demonstrations, and to raise money. Many of these bands were attached to missions, or other religious groups that promoted their (usually) Christian messages and also did “good works” amongst the poor, destitute, orphaned, sick and otherwise needy masses. They were very successful as musical ambassadors and helped these organisations significantly to change the lives of many people over the years – including some of their players, who were “brought into the fold” at various times. Do you know of any interesting or historic batons? Particularly those associated with brass bands? Ebony and other hardwood batons, often adorned with silver embellishments, were just the thing for conductors – particularly in the late 19th and early 20th centuries. Given as tokens of appreciation, or bought as status symbols, few still exist, and even fewer have an inscription or detailed provenance, although those with silver can usually be dated through their hallmarks. Joanna hopes that a project to collect similar records for the historic brass instruments in Polish museums will take place sometime in the future. Ever curious, I found an inscribed baton for sale on Ebay, presented to J.E. Reynolds of the Sheffield Comrades of the Great War Band, at the Blackpool Contest on October 30th 1920. A little research shows this to have been a military band contest promoted by the Blackpool Comrades of the Great War. Bands that competed (presumably all under the COTGW banner – there were quite a number of these formed after WW1 by returning veterans of the conflict – most were military in format/instrumentation, but there were a few all-brass bands) included Manchester, Staveley, Carlisle, Derby, Pontypool, Nottingham, Wallsend (3rd place), Sheffield (1st place), York (2nd place) and Middlesbrough – adjudicator was Colonel J. Mackenzie Rogan – the test piece was a selection from Verdi’s Aida and the march “Colonel Ward” by Cheeseman. A brass band contest was held at Indianapolis in February 1853. Was this the first such contest in the USA? Do you know of any earlier competitions? A brass band contest was held at Chillicothe, Ohio on Thursday 4th August 1859. Seventeen bands competed (although only 13 were named in the newspaper report). A second contest was held at Chillicothe the following year, with Hillsboro Cornet Band taking first prize out of 19 bands. It had been very generally announced, by posters, and “small bills”, all along the Marietta and Cincinnati R. R., for a week or two previous, that such a festival was to be holden on the 4th inst. ; but as Pomeroy has the misfortune to be located in the “rural districts,” it was not known, and consequently not attended by many that would otherwise have gone. It was our good fortune, however, to be in the locality of the Railroad the day previous, and “run a-foul” of a barn-door ornamented with one of these posters. The consequence was, we were taken with an inclination to go, and go we did. By the way, as many of our citizens go to Athens to take the cars, we would state for their benefit and convenience, that, seven miles north of Albany, there is a station called “Marshville,” which is a much more eligible point, especially for the western portion of Meigs, inasmuch as it is nearer, and the cars do not arrive till 1½ P.M., and then wait 20 minutes for dinner. The trains pass each other here. On arriving at Chillicothe at 5 P.M. on Wednesday, we found nearly all the rooms in the spacious “Valley House” already occupied, and guests constantly arriving. The prospects were truly encouraging. The morning, however, was lowery, and it was feared the affair would “fizzle,” but vehicles of all possible kinds, loaded to their utmost capacity, soon began to arrive, and by twelve o’clock the city was literally swarming. Lebrand’s National Band of Tarlton, Ohio; Martinsville Band; Brennon’s Band of Marietta; Beverly Band; Montgomery Band; Goshen Band; Waverley Band; Rainsboro’ Band; Lynchburg Band; New Market Band; Level Band; Lexington Band; and Centrefield Band. Each band executed two pieces of music. The committee was equally divided between Lebrand’s Band of Tarlton, and the Beverly Band of Beverly, Washington county, Ohio, for the award of the first prize, of one hundred dollars. They finally decided the matter by giving the award to Lebrand’s Band, they judging that the pieces performed by that band were more difficult of execution than those performed by the Beverly Band. The second prize of fifty dollars was awarded to the Beverly Band; the third prize of thirty dollars to Brennan’s Band of Marietta, and the fourth prize of twenty dollars to the Rainsboro’ Band. Menter’s celebrated Cornet Band of Cincinnati, was present, but as it is universally acknowledged to be superior to others in Ohio, did not complete for the prizes. It gave a concert in the evening. A collection of information about brass bands in the island of Ireland over the last 200 years. Following the suggestion of a friend, whose great-grandfather had played in a brass band in Eire in the early 1900s, I have extracted a subset of my earlier “Brass Bands of the British Isles – a Historical Directory” (2018). Over 1,370 bands are recorded here (93 currently active), with some 356 additional cross references for alternative or previous names. This covers both Northern Ireland and Eire. It excludes (as does its parent volume) fife/drum bands or bugle bands, but it does include some brass/reed bands, particularly from the earlier years when instrumentation was much more variable. There are also a greater number of bands which had political affiliations – something that was rare in Britain. 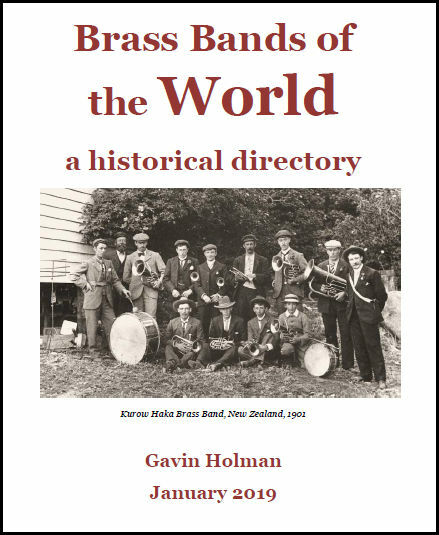 Following my historical directory of the brass bands of the British Isles, the companion volume, covering the rest of the world is now available. Again, it is far from complete, even more so given the range and extent of possible research sources for such bands. However, I regard this as a starting point, with over 9,500 bands identified (with some further 2,700 additional cross references for alternative or previous names. In addition, the availability of information, and some language issues, has meant that a fewer number of bands have anything more than basic existence and/or an extant date for them. Certainly this is not the end of the story – increasing amounts of historical material are available online (digitised newspapers and archives, for example), which will allow more in-depth research for further bands and further details for known ones. As always, I welcome any information about such bands, which will go towards the next edition. A new book – The History of Earby Brass Band – has been written by Stephanie Carter. Copies are available from Earby & District Local History Society (£10 + £3.50 p&p) – email info@earbyhistory.co.uk for details. Earby Brass Band can be traced back to c.1847, and this book records the history of the band and it’s players from then until the present day. It has lots of photos to chart the band over years.